The official ingredients in spaghetti alla carbonara are: guanciale, eggs, pecorino romano cheese, black pepper, and spaghetti. Anything else is extraneous, even salt (which you really don’t need because of the salty cheese). You’d think with such a simple list it was almost impossible to go wrong, but I have had some really awful carbonaras, often cooked by people who should know better. Pecorino romano cheese is recognizable by its black rind. Spaghetti alla carbonara is considered to be part of Roman cuisine and it was in Rome that I had my eye-opening experience when it comes to this dish. Instead of the usual watery white cream sauce, with pieces of scrambled egg and pink bacon cubes floating in it, I was presented with a plate of spaghetti, coated in a rich, velvety, yellow sauce, with pieces of crunchy russet bacon. I will never forget the first mouthful and it prompted me into action. Like an ancient gladiator, I set myself the challenge of learning how to make carbonara like a Roman or I would die in the process: morituri te salutant! After a lot of research, trial, error, and eating some of the best carbonaras in Rome, I finally came across a fool proof method, which is perfectly faithful to the traditional recipe and has elicited the phrase veramente buoni from residents of Rome. Get a pen and paper ready, because I am about to divulge my secrets to you. Ready? Guanciale is not pancetta. Know your ingredients. The first thing is to make sure that you have the right ingredients. Many recipes call for pancetta but the real recipe calls for guanciale. This comes from the guancia or cheek of the pig, a cut which is not used in the USA or UK but which is more tender and fatty than pancetta. If you can’t get guanciale I would recommend using streaky bacon, thinly sliced and then cut into strips of about a centimetre in width. If you must use pancetta then buy it sliced and again cut it into strips. Do not, and I repeat, do not use cubes or lardons as these are too thick and will give the wrong consistency. Cook the guanciale until it’s crispy. Use really fresh free-range eggs. These are likely to have dark yolks which will give the finished dish its deep yellow colour. In Italy, you can buy such eggs marketed for pasta gialla (yellow pasta). For the cheese, only pecorino romano DOP will do as it has the right taste and melting point to make the sauce how it should be. At a push, parmigiano reggiano could be used but make sure it’s the fresh, softer kind, since this will melt more readily when you cook the dish. Always grate the cheese yourself and never use pre-grated cheese, especially if its labelled Parmesan Cheese. It’s not the same thing at all. Beat the eggs for about five minutes until they are fluffy. There is one thing I need to point out as it’s the real secret. Never, ever, ever, add the egg mixture into the hot pan with the cooked spaghetti, as some recipes state, since this will always result in scrambled egg. Instead, add the cooked spaghetti to the egg mixture in a large bowl, preferably the one you will serve the pasta from. The heat of the pasta will cook the eggs and melt the cheese into a delightfully creamy sauce. Any other method will not work. You have been warned. For perfectly cooked pasta 100g pasta = 1 litre water + 1 teaspoon salt. The quantities below are based on two people. 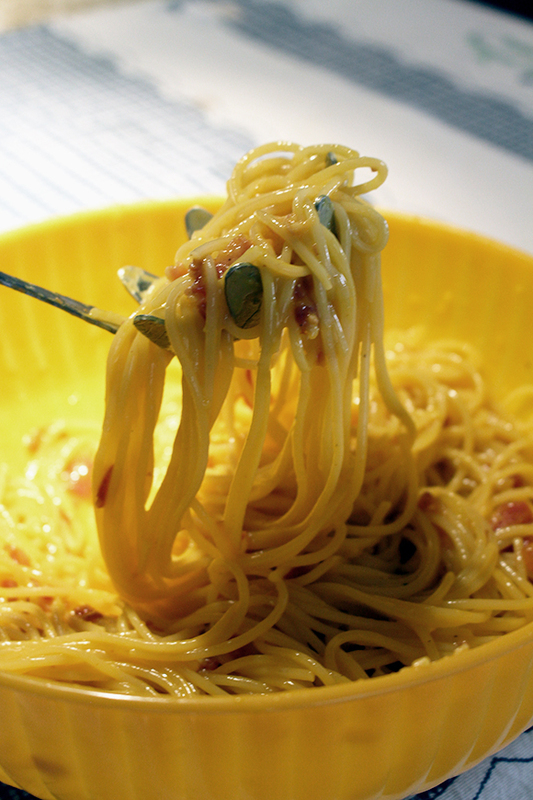 To cook for more, simply add 150g pasta, one egg yolk, 100g guanciale, and 100g cheese per person. Make sure you increase the amount of water and salt, according to the following ratio (100g pasta = 1 litre water + 1 teaspoon salt). Use the best quality ingredients you can buy. Cook the pasta with the correct ratio of water and salt (100g pasta = 1 litre water + 1 teaspoon salt). Beat the eggs thoroughly for five minutes until light and fluffy. Always add the cooked spaghetti to the egg mixture never the other way round. Don’t add extra salt as the salt in the cooking water and the saltiness of the cheese are enough. Follow all this advice for the best carbonara you’ve ever eaten and just like you’d find it in Rome. Put the water in a large pan, add the salt, cover and bring to the boil. Heat a frying pan, add the guanciale and cook gently until crispy, about ten minutes. You shouldn’t need to add any oil, because of the high fat content of the guanciale. If necessary, drain off the fat halfway through cooking to ensure that it ends up crispy. When ready, allow it to cool. Put the egg yolks and whole egg into a large bowl and beat them together with a balloon whisk for at least five minutes until light and fluffy. Add the grated cheese to the eggs and mix thoroughly using the whisk. Add the black pepper and mix once more. Then add the cooled guanciale and mix again. Cook the spaghetti al dente according to the manufacturers’ instructions. When ready, remove a cup of the cooking liquid. Add the spaghetti to the bowl with the eggs, cheese, and guanciale. Do not add the egg mixture to the spaghetti in the hot pan. Toss thoroughly so that all the spaghetti is coated in the mixture. If absolutely necessary add a little of the cooking liquid to ensure that the sauce covers all the spaghetti. Have you ever eaten carbonara in Rome? How did it compare to other versions? Have you any other advice? I’d love to hear from you in the comments below. You nailed it, Luca! In Rome, I lived in Via della Grotta Pinta (in the Centro Storico), above a wonderful restaurant called Arnaldo’s, which specialised in Spaghetti alla Carbonara. One day, at the corner bar, Arnaldo revealed to me that a secret of a good Carbonara is adding the cheese to the beaten eggs. Then, he said, the egg-cheese (pecorino romano) would coat the pasta. It works every time. Thank you for posting your recipe. I’m going to send the link to my daughter, who is always searching for a good carbonara recipe. Yours is the best! Thanks Francesca! How lucky you were to live in the centro storico and to have a chef reveal his secrets to you. That’s exactly how it works: the melted pecorino and eggs making the most delicious cheese sauce ever. Glad to have helped you out! Tell your daughter to let me know how it goes if she tries the recipe. Genius adding the pasta to the egg. I’ve always done it the other way and tried to counter the scramble effect by stirring in some of the pasta cooking water. And you keep an egg white! I can’t wait to try your way. It’s the way the Romans have been doing it since the beginning. It’s a whole other dish, no? Haven’t tried it yet – but I will this week! We made this as closely as possible to your recipe for 2. Couldn’t find the correct guanciale in North Yorkshire but substituted pancetta sliced finely and that was fine. Importantly the directions to finish the recipe were spot on and resulted in the hoped for glossy pasta with no sign of scrambled egg. Our only real criticism concerns portion size. We made this as directed for two adults with healthy appetites but neither my husband nor I could finish our meal, next time we will half quantities as this isn’t a dish that can be frozen for later. Might also reduce the proportion of cheese slightly. As mentioned above we made this again using less cheese. Now the recipe suits us to perfection we find that half your quantity of cheese is just right for two hungry adults. Thank you very much for another recipe now a regular part of our repertoire. Oh, yes! I was lucky enough to be introduced to Roman carbonara in a small trattoria in Trastevere. It was an eye opening experience.